The Playground Advocate: Teacher Creativity Skill: Meet Someone Amazing! 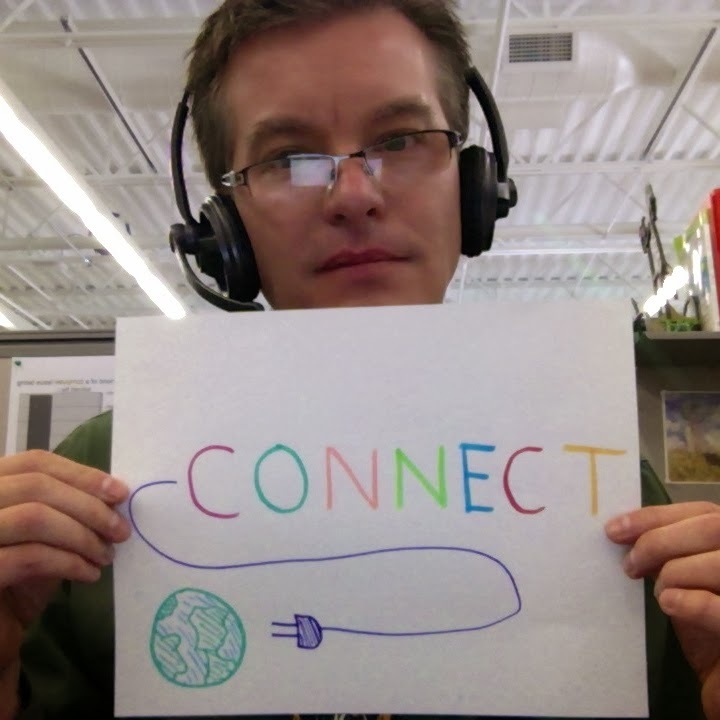 This being Connected Educator Month, I've been reminded over and over about the power of connections. Sometimes meeting someone new changes your whole perspective on the world, and collaborating with someone new can change how you understand the work that you do. It's all about expanding your horizons and finding new filters through which to view the world. As powerful as this is for us as adults, I know that it is even more powerful for our students. Exposing students to new perspectives and new voices can inspire learning by piquing curiosity and motivating exploration and reflection. I've watched this happen to students who have Skyped with the authors of books they've read and with classes who have connected with other learners in other parts of the world. The excitement of bridging the gap between the classroom and the world is easily attained, and the rewards are immediately visible. Moreover, the technologies that enable this kind of communication are free and easy to learn. Any Internet-enabled device can make video conferencing a reality, and the power of social media tools like Facebook, Twitter and Google+ make connecting a classroom to the world possible for anyone with an account. Companies like ePals, websites like Skype in the Classroom and Google+ communities like G+eduhangout make finding a connection easy. All of this adds up to the fact that conversations that begin with "You know what would be cool..." can now end with "Let's make that happen." More often than not, if you can create a reason to connect with someone virtually, you can also find the people willing to meet you halfway. In the past two years, I have seen countless examples of classrooms connecting with amazing people from around the world, from astronauts to Shakespearean actors, from grandparents in Germany to classrooms in Brazil. I've even watched as a choir director in another city gave a choir here in Evansville feedback over Skype ahead of a competition. I think the reason more people aren't doing these types of things in the classroom more often is simply that reaching out hasn't become a comfortable part of everyone's workflow yet. But if the many examples of global projects is any indication, that is changing. Look at what you are teaching, and ask yourself who would it be cool to connect with in this lesson/unit/project? Are you studying the Holocaust? Perhaps there is a survivor who can speak to your class. Are you writing poetry? Maybe a published poet could Skype in and lead a workshop. Are you learning about the continents? Wouldn't it be cool to connect with a class from each continent to compare cultures? Think about who you know or are connected to and consider what they have to offer to your classroom. There may be a grandparent of one of your students who can read a favorite childhood book. You might have a friend from college who now works as a marine biologist. Or maybe your cousin lives in Boston and could Skype live from an historic site. Ask yourself what are my goals for my students and try to find a project or a partner to meet those goals. Students can have amazing opportunities to make an impact on their world, and in the process they can connect to new people. For example, students might take on a micro loan project to fund a start-up in another country or they might collaborate with students across the world to address an issue of international concern. Use technology and social media to find someone to connect with. If you don't know someone who can speak to your class on a topic, there are lots of ways to find someone. There are communities built around making connections for the classroom, for example. If none of those yield results, you can tweet and post on Facebook that you are looking for someone to connect with on your topic. You'd be surprised how often that can yield results. If you can imagine the person who would be the perfect fit (a specific author, celebrity, politician, etc.) Some focused Internet research can usually produce contact information. Don't be afraid to ask. People generally like to talk about their work or what they are passionate about. Also, many people feel that connecting with students is a good use of their time and are willing to make that happen. Not everyone is like that, but you won't know unless you ask. The worst thing that will happen is that they will ignore you or say no. The best thing that will happen is that you will create an amazing experience for your kids. Become comfortable with the tools that enable connection, interaction, and collaboration. At this point, refusing to make these connections because you aren't familiar with the technology is a pretty lame excuse. None of this technology requires special expertise, nor is it unaffordable (there are plenty of free tools with which to make connections). Spending the time to learn the tools will enable you to take advantage of opportunities to connect in the future, even at a moment's notice. When you meet a fellow educator who is speaking your language, come up with a project that you can do together. If you meet someone via social media, at a conference, or even while traveling, and that person teaches what you teach or shares your ideas about learning, take the opportunity to develop that relationship by creating ways for your classes to connect. Making a plan to connect with another educator will ensure that the connection is purposeful and has mutual benefits. Studying topics like environment, culture, or events that affected both locations can be enhanced through this type of connection. Imagine a book club that includes the impressions of readers from two very different places, or a science project that collects data from multiple locations. When you have a plan to connect, be clear about your purpose and how you imagine the interaction will go. Planning ahead can help to overcome any initial awkwardness of connecting people or groups. As with planning for the physical classroom, planning for a virtual lesson is important so that people don't feel that the connection is a waste of time. If you are having an expert meet with students, have the students prepare questions ahead of time and share those questions with the expert so that he or she knows what to expect. If students are connecting with students, give them an agenda or list of goals to accomplish. Test your technology ahead of time, have a plan B in case it doesn't work, and be flexible enough to bring the connection to life later if needed. Technology is always going to be a bit unpredictable. Taking the time to test a connection ahead of class can often help to avoid problems. Even so, if suddenly there is a technology glitch, be prepared to troubleshoot but also to move to another activity. You can always take another run at it on a different day. Follow-up with your connection and your students. Assess what worked well and what didn't and apply that to your next connection. Like any classroom strategy, connecting virtually takes some practice to make it as powerful as possible. Getting feedback from kids about what they got from the lesson will help guide how you structure future connections. Also, the person/people you are connecting to can offer suggestions for the future. Share your successes to inspire others. When you are doing activities like this, it is valuable to share your takeaways with others. Be prepared to take a few photos, record the interaction, and invite colleagues in when you are doing these types of things. Once they see the power of this type of learning, they will want to try it themselves. At the end of the day, making the effort to bring new voices, ideas and perspectives to the classroom can impact teacher and student creativity. A new experience can act as a catalyst to our own thoughts, inspiring us to move in new directions, ask new questions and approach problems with new strategies. By developing this skill in ourselves, we expand our classroom toolbox. By developing this skill in our students, we connect them to a world of ideas they might otherwise never realize existed.